Safe degreaser for use on many surfaces including un-lacquered and polished aluminium, stainless steel, most plastics, carbon fibre, Kevlar, anodising, titanium, silicon hoses, painted surfaces, fibreglass, alloy wheels. Designed for use on engines, gearboxes, chassis, engine bays, door shuts, parts wash tanks and other workshop applications. Quickly and without aggressive agitation will remove the heaviest oil, grease dirt and general day to day grime preventing damage to painted or polished surfaces. Use a hot wash for even faster results. 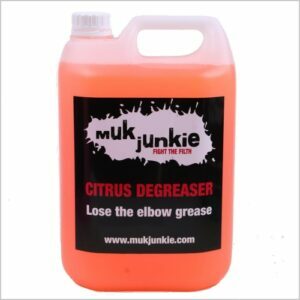 Muk Junkie Citrus Degreaser will reduce time spent cleaning up all oils spills. Advanced formulation offers rapid and very safe results without using any harsh, petrochemical derived solvents, acids or caustic solutions. Safe cleaner for use on all surfaces including un-lacquered and polished aluminium, stainless steel, all plastics, carbon fibre, Kevlar, anodising, titanium, silicon hoses, painted surfaces, fibreglass, alloy wheels and all rubbers. Designed for use on chassis, bodywork, shock absorbers, engines, gearboxes, wheels, tyres and race interior applications. 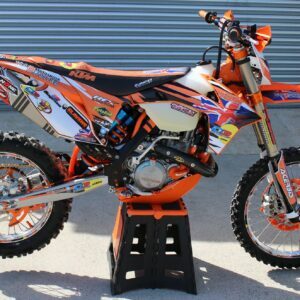 Quickly and without agitation or brushing will remove the heaviest mud, dirt and general race day grime preventing damage to painted or polished surfaces. 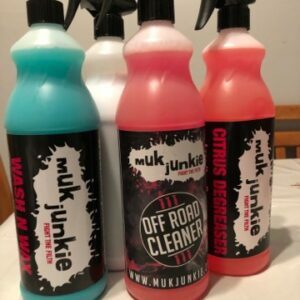 Muk Junkie Off Road Cleaner will save hours on your cleanup process after a racing event. Safe cleaner for use on all surfaces including un-lacquered and polished aluminium, stainless steel, all plastics, carbon fibre, anodising, titanium, painted surfaces, powder coating and all rubbers. Designed for use on frames, controls, brakes, discs, shock absorbers, forks, wheels, hubs, tyres chains and gear sets. Muk Junkie Bike Cleaner will save hours on your cleanup process after a racing event. Super fast acting, one wipe and buff glass and mirror cleaner suitable for cars, caravans, boats and household cleaning . Quickly and safely will remove dirt, dust, grease and general grime with one wipe and buff. High shine bike spray to make all treated surfaces shine like new. Built in corrosion protection for all metals to prevent rusting or oxidisation. Safe on all plastics, leaves a protective layer so that cleaning your bike will be a breeze. 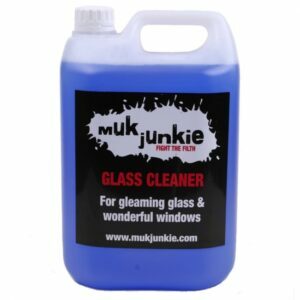 Muk Junkie Heavy Duty Alloy Wheel Cleaner will save time on your bike cleaning process. Advanced formulation offers rapid results without using any harsh acids or caustic solutions. Here is the quick link to pay for our Supported Rider Package. Please do not pay for this deal online until you have been sent the link by us!